Sinn Fein MLA for Newry and Armagh Mickey Brady has said a series of death threats he has received will not deter him from working for the community. 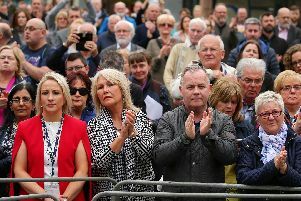 Speaking after the latest threat, Mr Brady said: “On Monday I was told by the PSNI that a threat has been made against my life. I was then told that a second threat had been received, in a phone call, in the early hours of Tuesday morning. “This was followed by a bomb threat at my family home this morning.